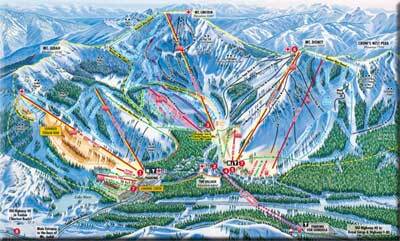 Sugar Bowl is a family resort and once host to the Olympics. The resort is constantly growing and has never lost its original charm even though it has been moderinzed to today's tough ski standards. The resort trail runs consist of a good balance between beginner, intermedia and advanced terrain, and there is plenty to do, with the nearby town of Truckee just a few minutes away. Take a look at all the fantastic ski runs at Sugar Bowl Mountain. Click the map to make it grow!